MeshFiltration has been providing Printing Mesh Series,Filter Mesh Series and Metal Wire Mesh Series products for over 30 years. 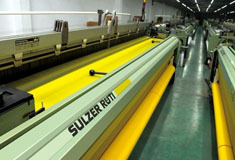 As an ISO9001 certified manufacturer, MeshFiltration owns 90 sets of P7100 and P7150 Sulzer looms, 4 Benninger warping machines and over 300 experienced technicist∏uction employees . Since founded in 1981, MeshFiltration has been devoting herself to providing high quality mesh you need with good price in one place. We don’t just supply mesh products; we provide complete solutions.